Morse Express has commissioned its ninth annual Christmas Key. Our 2009 Christmas Key is a precision miniature key made by GHD Keys, incorporating traditional Japanese craftsmanship along with GHD's impeccable engineering. In keeping with GHD's larger keys, the Morse Express 2009 Christmas Key uses miniature ball bearings at the trunnion, miniature binding posts, comfortable knob, and perfect balance. The contacts are hard-silver and the mechanical parts have a deep polished chrome finish. The rectangular base is a heavy mahogany selected for warmth and grain. The knob is hand-turned. 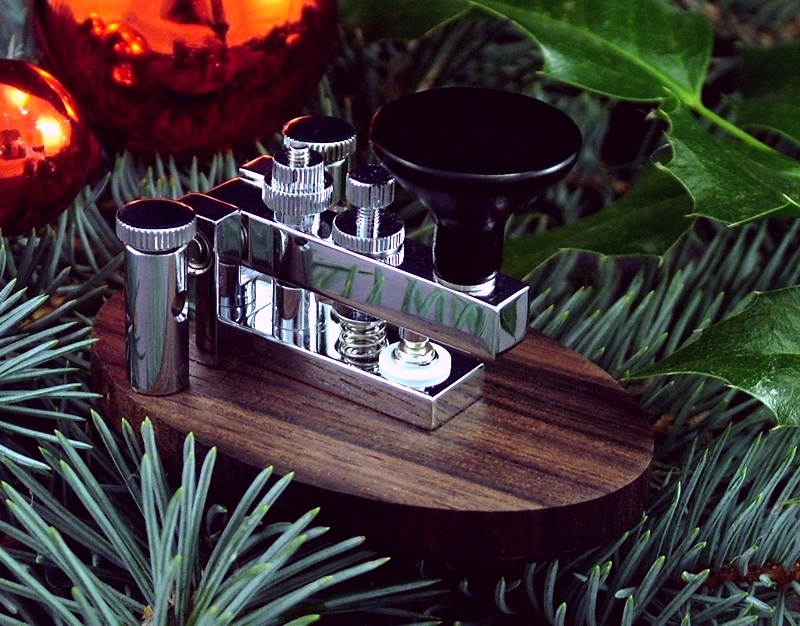 GHD Key's Toshihiko Ujiie combines modern and traditional techniques to produce a miniature key that will be equally at home in the radio shack, in the field, or decorating a Christmas tree. The Morse Express Christmas Keys have always been miniatures, and the 2009 key is the smallest yet. It measures a tiny 1-3/4" by 1-1/4" at the base, which is about half the size of the 2008 key. The 2009 key weighs a mere 1.6 ounces, but the keying geometry is such that force is applied down through the base of the key, and it is surprisingly stable. Each key has a label with “Christmas 2009” and the key’s unique serial number. The 2009 Christmas key will add something special to straight key operations through the Holiday season and Straight Key Night. This is a LIMITED EDITION of 150 keys. 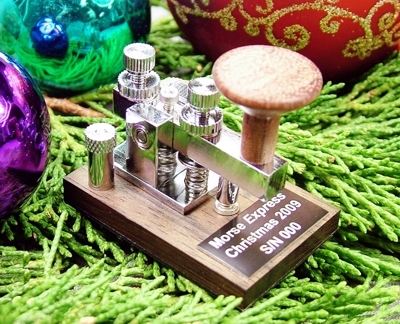 The Morse Express 2009 Christmas Key is $89.95 (plus s/h) and is available exclusively from Morse Express. Click on the "Add to Shopping Cart" link below to start the ordering process by opening a shopping cart. From there you can proceed to "check out" and provide the other ordering information. Be sure to change the quantity if you want more than one key. If your browser is accepting "cookies" you can continue shopping and order other items before proceeding to "check out." A word about the serial numbers... if you bought our 2008 Christmas key last year, then the same serial number will be held for you this year, until approximately the end of November. The exact date will depend on how quickly we sell out of "unallocated" numbers, so if the number is important to you please order sooner rather than later. Thank you very much for your order, and I hope our little Christmas key brings a little extra joy to the holiday season for you!